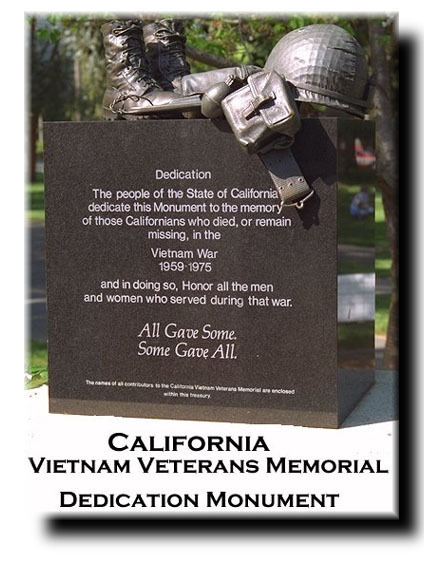 California Vietnam War Memorial: The California Vietnam Veterans 3,750 square-foot Memorial is located in the north-east corner of the State Capitol grounds at 15th Street and Capitol Avenue, Sacramento. 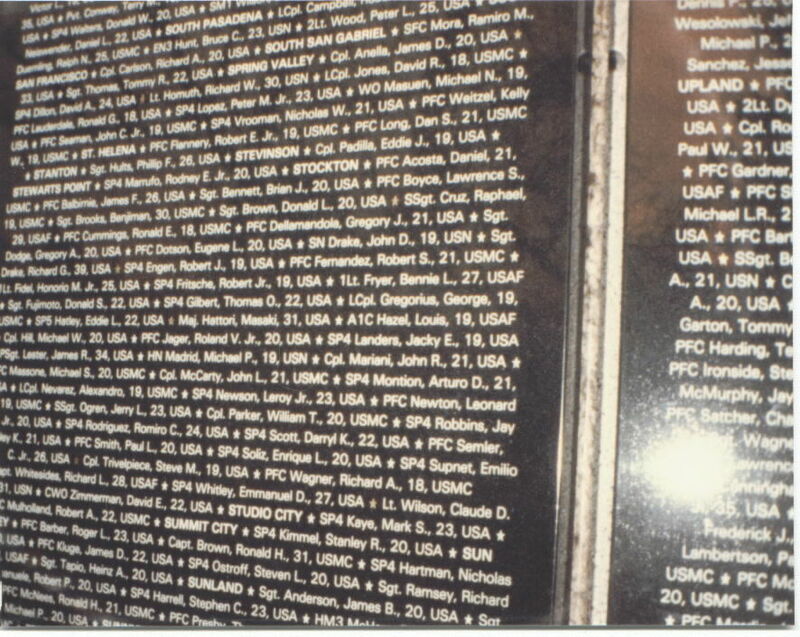 The Memorial serves as a literal tribute to those 5,822 servicemen and servicewomen killed and missing in action. It is found near the Rose garden and weeping cherry trees in a quiet, lush setting. 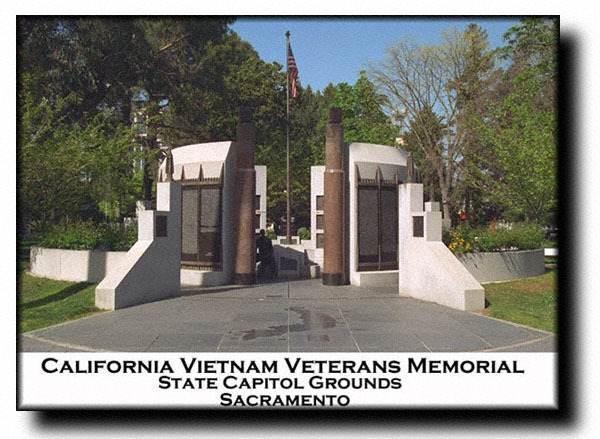 Wide, concrete paved paths lead to the Memorial from the street as well as from the rest of the Capitol grounds. 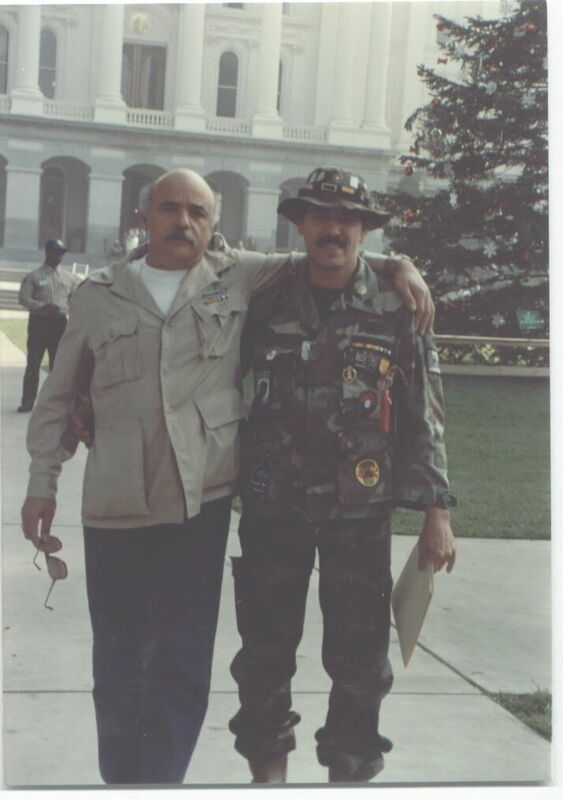 There is a large grassy area around the Memorial, planter boxes of white roses with sitting areas. 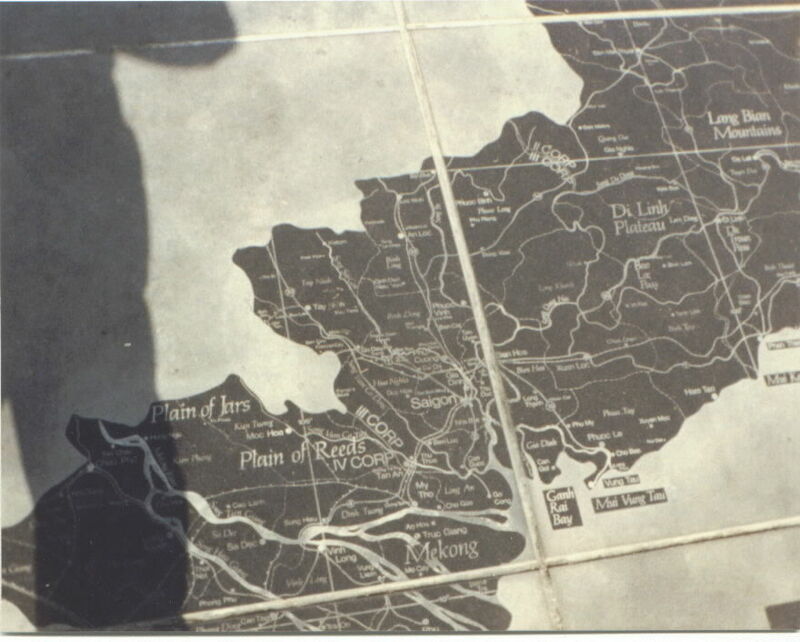 To prevent further vandalism, the CA. 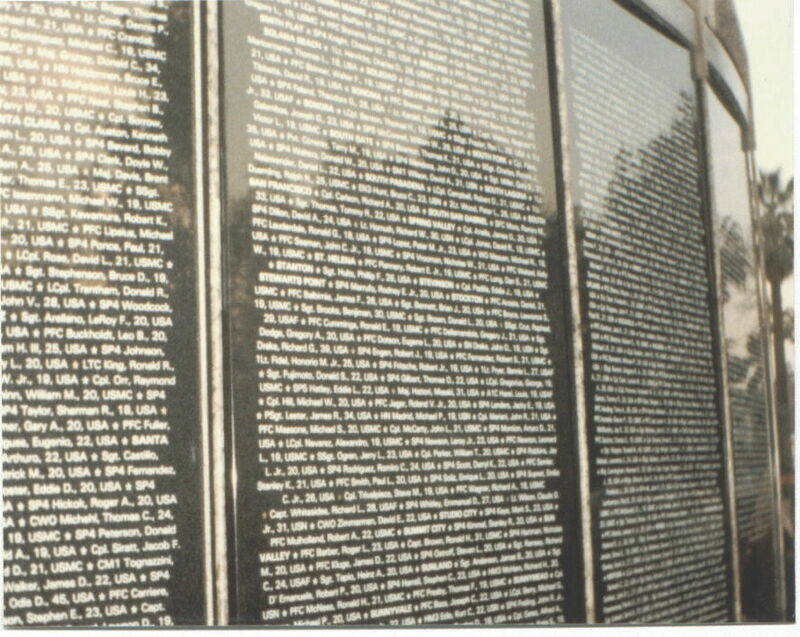 State Police proadly watch over the memorial. At the three entrances are pylons capped with 24 hour lamps that symbolize eternal flames. 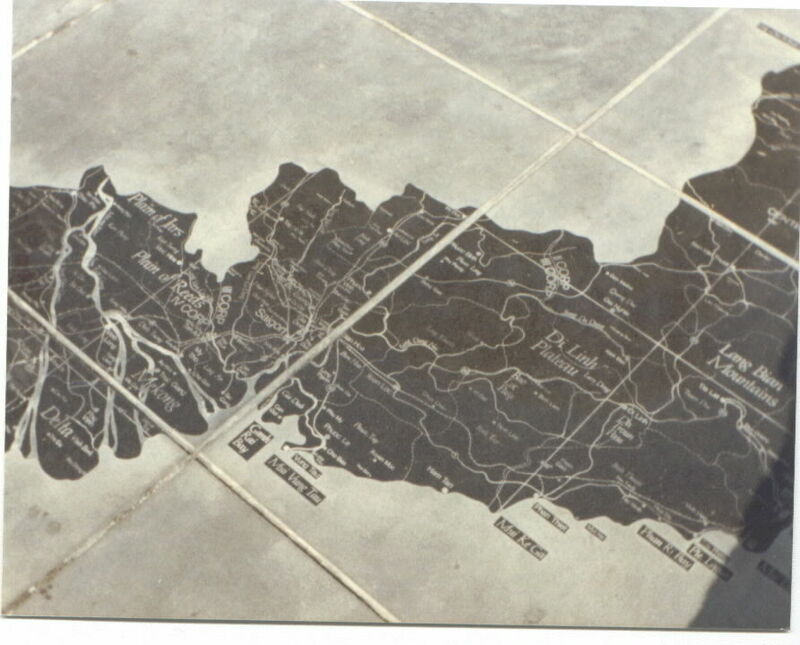 The Memorial is circular in design, with full relief bronze sculptures depicting scenes from daily life during the war. 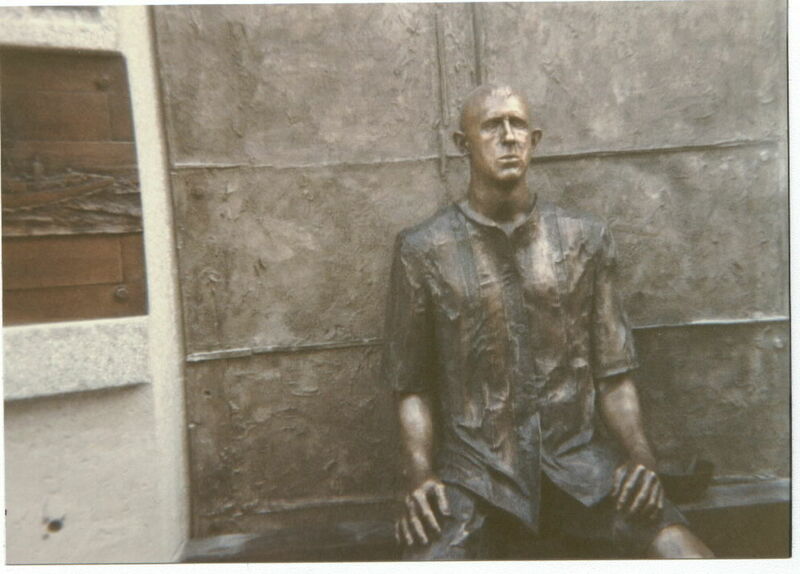 The sculptures represent many sides of the war, with grunts, nurses, and POWs. 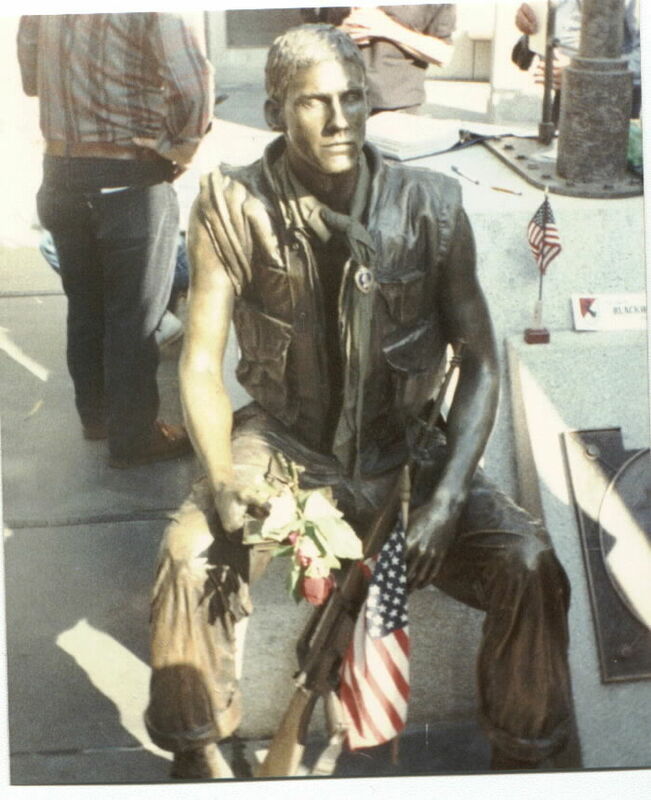 The central bronze is the 19 year old combat soldier reading a letter from home. The American flag waves over the Memorial. 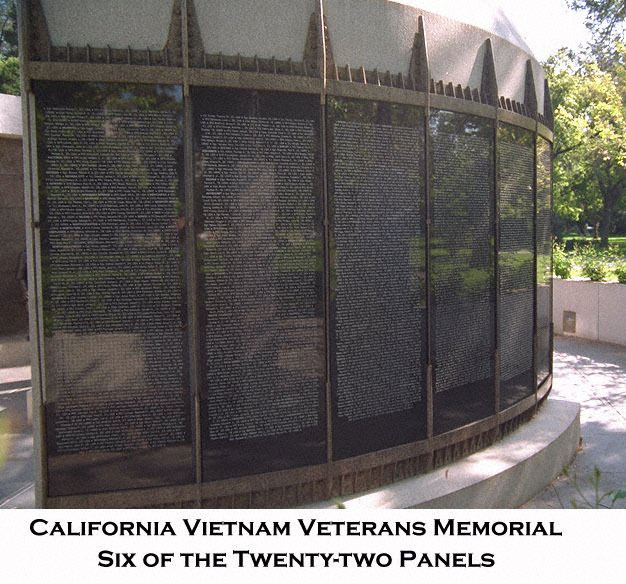 The 5,822 names of California's dead and missing are engraved on twenty-two black granite panels, arranged by their hometowns. 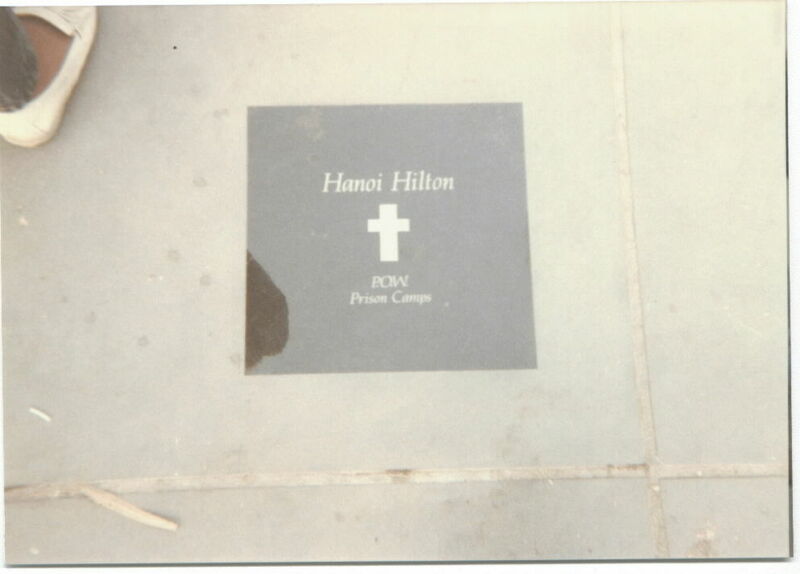 In a ring arranged around the granite panels, there are stone benches facing the names. 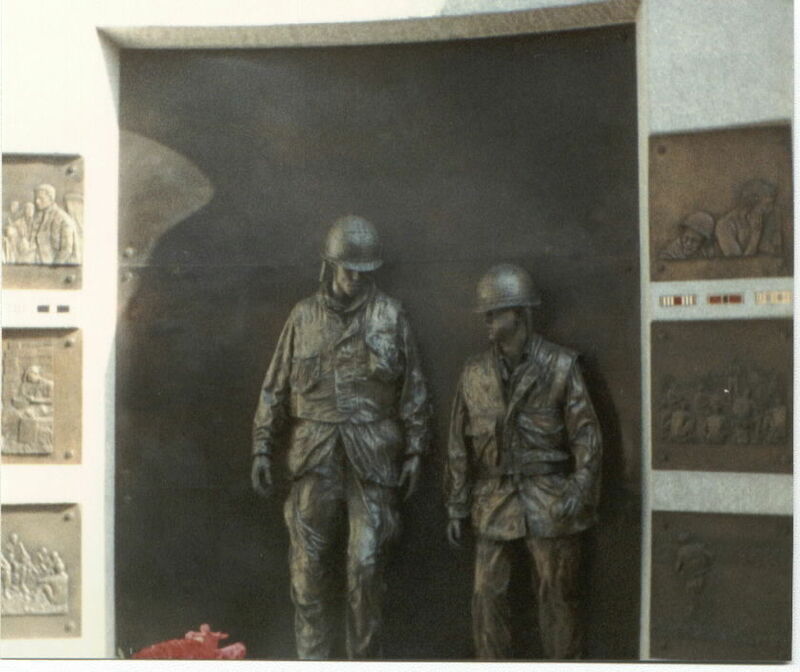 The North Niche shows soldiers in combat on 21 X 21 bronze plaques. 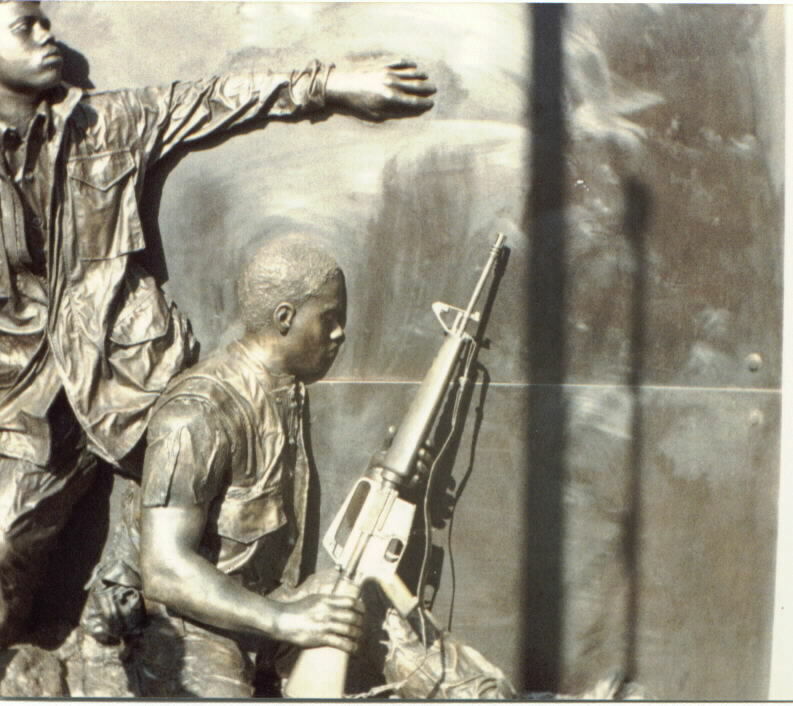 The East Niche has two Brothers showing comradery and friendship that was well known in Vietnam. 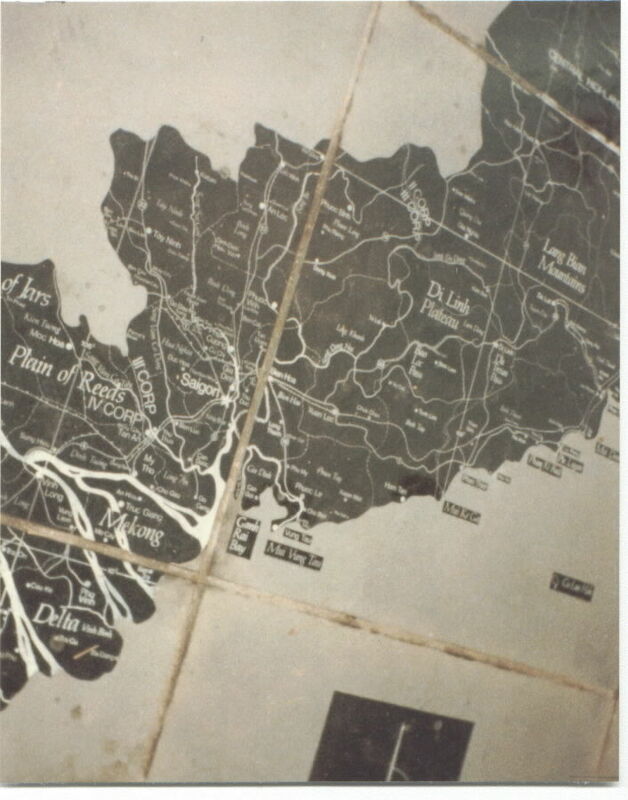 The South Niche is the Prisoner of War, the only US memorial at the time to honor the courage, endurance and ongoing suffering of our POWs. 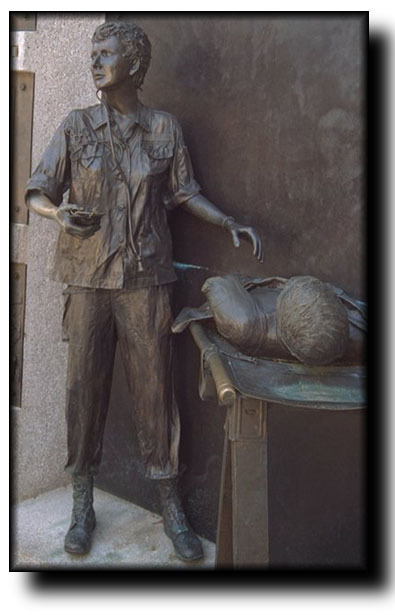 The West Niche depicts nurses tending to the wounded, the only state memorial at the time to honor the contributions of American women in combat. This is truely a place where silence speaks.